I'm pretty sure that zucchinis were my gram's favorite vegetable. I say this because almost all of her vegetable recipes revolve around them, and besides peas, they were the only green veggie I ever remember her serving me. My research is inconclusive; I should probably just ask my dad. My gram was a huge fan of crab cakes. Most of the time when we would go out to lunch, she would order a crab cake plate, and boy was she picky about them. She was right to be, of course- who wants to get something in a restaurant that isn't as good as what you can cook for yourself? Since her crab cake recipe was so excellent, it makes sense that she would have found an equally wonderful recipe for mock crab cakes. 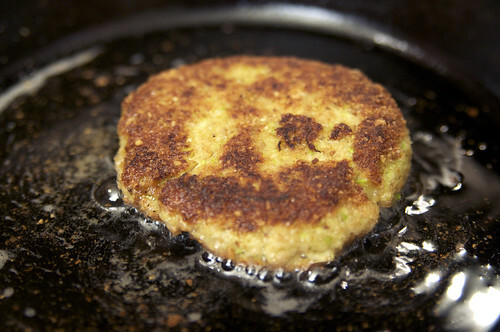 Anyway, her mock crab cakes are based on finely grated zucchini, which is thrilling to me, since I've been obsessed with making zucchini fritters for the past year. Trust me, these cakes, when paired with an easy pepper sauce, are way better than any zucchini fritters you may have eaten in the past. These look and smell (and taste) so good that when my friend Mike saw them, he asked me several times if I had made real crab cakes. 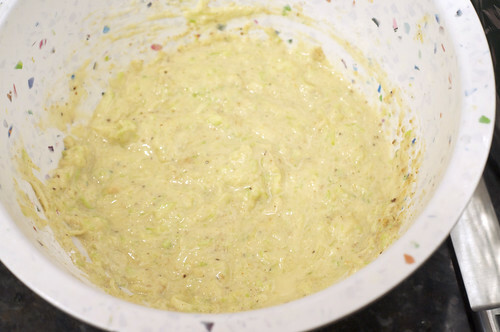 The sauce I made isn't a recipe of my gram's, it's just something I found online when I was looking for a sauce to dress up crab cakes. 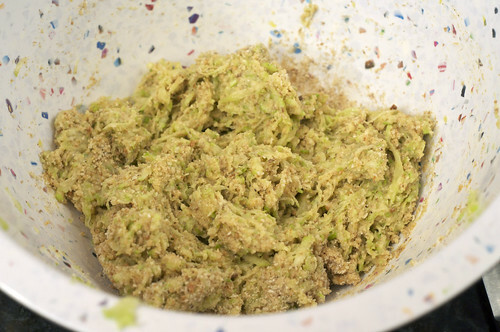 And yes, you will have to get out your food processor or blender to make it- but it is so worth it. If you're in a hurry you can just eat these with some tartar or ketchup, but if you have an extra 2 minutes, just whip up the red pepper sauce, you won't regret it. Time for me to stop talking about how amazing this was, and tell you how to make it for yourself. 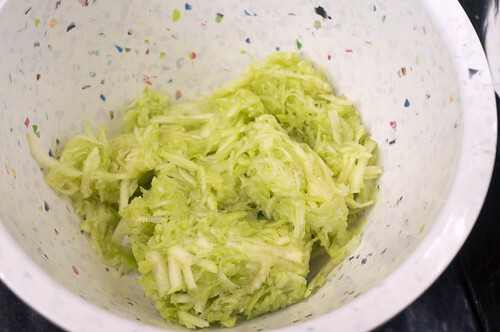 To drain, place grated zucchini in a bowl or sieve and sprinkle with a little salt. Let sit for a few minutes, then pick up the zucchini, ball it up, and squeeeeeeze until you think there's no way you could squeeze any more water out of it. Set it back in the bowl, wait a few minutes, and squeeze out the water again. 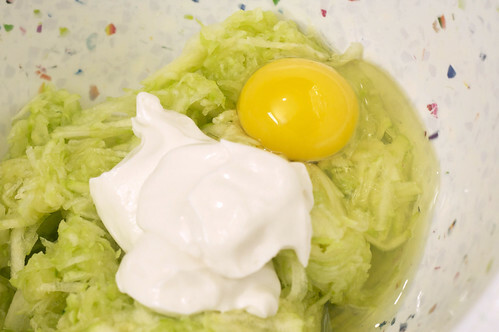 You really want to get as much water out of the zucchini as you can, or else you'll be rewarded with a big bowl of soupy batter- which tastes fine and can be used to make fritters, but it isn't pretty and the texture is totally different. Yuck. 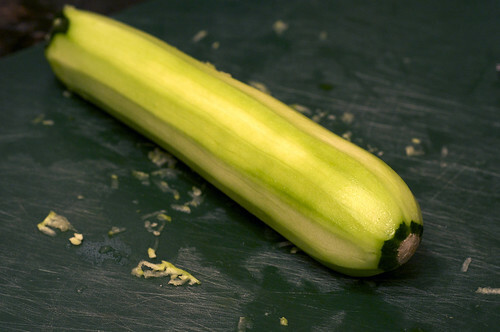 Now that I've convinced you of the importance of well-drained zucchini, we can move on. 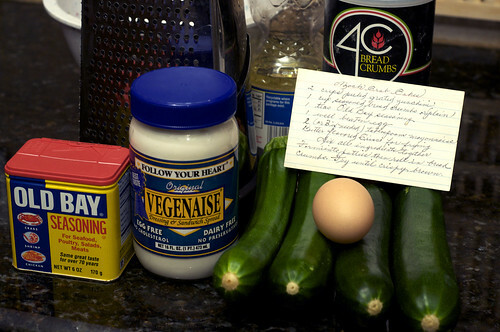 Add mayo, egg and Old Bay to the zucchini, mix well with a fork. Form mixture in to patties. 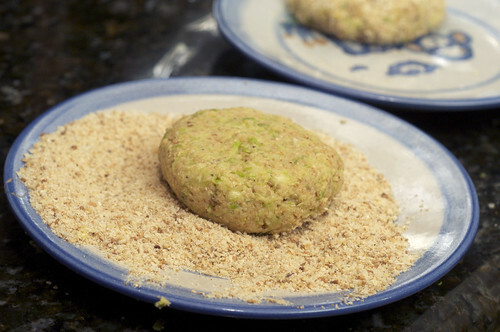 Roll the patties in extra breadcrumbs. Fry in a pan with a little oil until golden. Remove from the oil, drain on a paper towel. Garnish however you like (red pepper sauce! Red pepper sauce!) and eat. YUM! 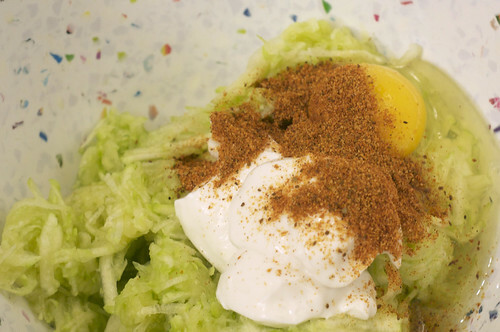 Put ingredients in blender. Blend. Pour in to a container and reserve in the 'fridge until you are ready to serve. I just used jarred peppers and some random chili paste/sauce that I found in the produce aisle. So easy, so yummy. Omg, I love you! I will have to get the ingredients for these asap! Zucchinis are great in all sorts of things. This looks like a great new way for me to use them. I will definitely try this out. 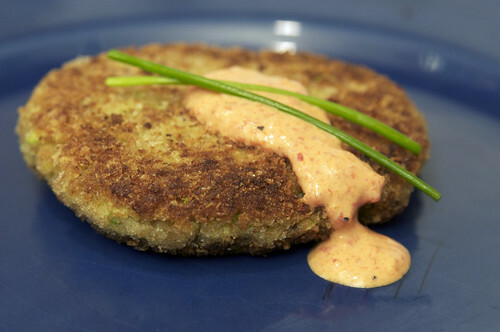 I love crabcakes - real crabcakes, but I'd also love these fake crabcakes. 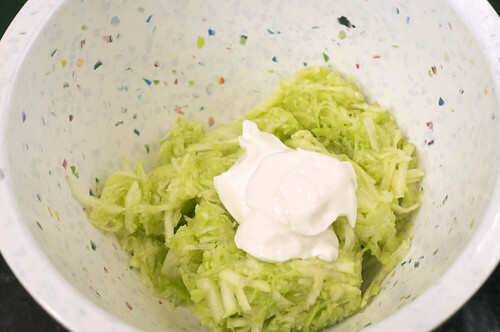 I think I'll call them zucchini cakes though to avoid any confusion. I have these on my blog as well. Honestly when zucchini is in season, I have them all the time. I LOVE them! I made these, and though I did not make the sauce to go on top, I did not miss it!! These bad boys rocked on their own. Thanks for posting. Awesome recipe! !